We Offer Client Website Hosting and So Much More! Advantage Marketing’s interest in developing custom websites for local businesses began with a solid foundation of advertising and marketing experience. It has always been our passion to help customers to grow their business through quality marketing, and it is this passion which led us to creating quality printed publications and online venues for effective advertising of their products and services. Our marketing is proven to bring results! 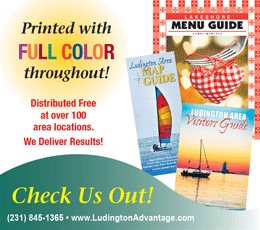 We publish three printed guides annually, and distribute them at over 100 Ludington area locations, starting each spring and continuing throughout the busy summer season and early fall. You may have already seen our magazine racks at various restaurants, lodging facilities and area merchants. All our publications are distributed free of charge. The Ludington Area Visitors Guide is a very comprehensive 64-page magazine with full color throughout and stunning photographs of the area. Lodging, restaurants, things to do and camping are just a few of the sections in the guide. First published in 1991. The Ludington Area Map Guide features detailed maps of downtown, the coastal region including Hamlin Lake and the Lake Michigan shoreline, Ludington State Park trails, all of Mason County, and more. First published in 1998. For the best places to dine, we also publish the popular Lakeshore Menu Guide featuring menus from restaurants from Ludington, Scottville, Manistee, and other West Michigan communities. First published in 1993. Our online marketing venues offer many benefits and good results for local and regional advertisers . Realizing the importance of having a strong internet presence, we started our website department by creating tourism websites back in 2000 when the general population was becoming accustomed to surfing the web for information. Starting with VisitLudington.com (This website continues to earn top organic rankings and a large volume of traffic for those seeking information about Ludington attractions and activities, where to stay, places to dine and shop, and much more.) and HamlinLake.com, (Our Hamlin Lake website maintains high organic positioning in Google searches.) other websites soon followed. Advantage Marketing eventually brought all our West Michigan websites together under the umbrella of WestMichiganGuides.com, connecting Ludington, Hamlin Lake, Scottville, Pentwater, Silver Lake, Manistee, and the Ludington State Park, forming the “power of community” and propelling us to high ranking positions in the most popular searches. We are continually updating the sites; taking input from your emails and adding things that are of interest to you. Not all of our advertisers primarily serve tourists, so we decided to broaden our scope and create online publications to serve advertisers who desire to target local residents. Our special interest websites provide just the right venue for businesses to find new customers for their products and services. Every day, things change around us, and we’re always looking for new and better ways to introduce our community to the world. We hope you enjoy our publications – in print and online – as much as we enjoy producing them.